Just finished piecing the charm pack quilt. Three borders – two narrow and one wide. 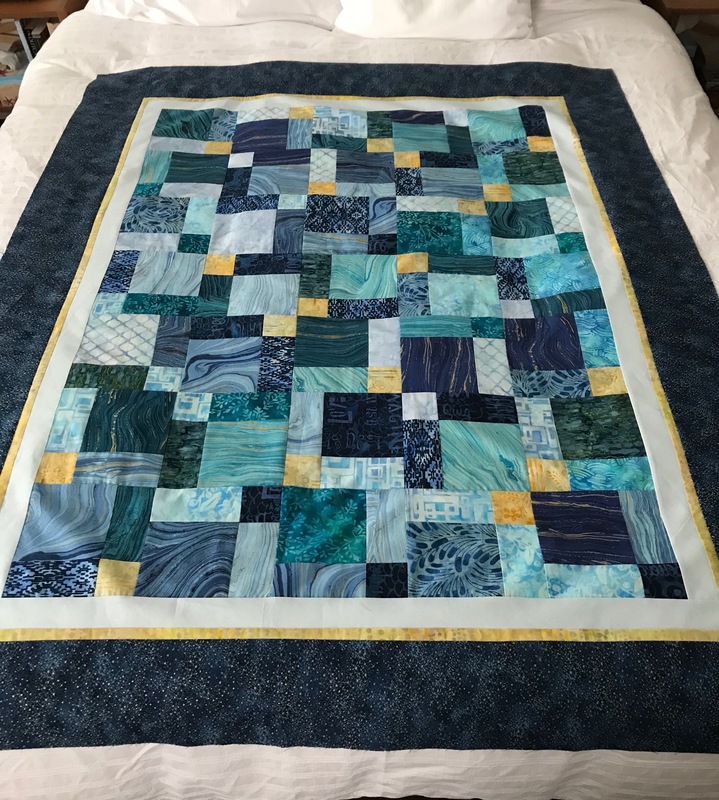 The overall finished size will be 47″ x 60″ – a good lap quilt size. Now my problem is the back. I have 53″ of potential backing fabric (the same fabric I used for the dark wide border). To make that work I have to extend the length by 12″ in order to have enough hang-over to be able to quilt the project. I have enough leftover blocks to create a strip and with borders I can make the insertion strip the required width to give me the length I need for the backing. The width also has to be extended – I have a workable 42″ in the width-of-fabric – I need a finished width of 51″. I will have to extend the width another 11″ – 12″. That will mean using almost a third of the blocks in the unused pack for an insertion strip. The easiest way of doing this is just to extend one side of the length and of the width but that will end up being trimmed and I want the entire inserted strips to be included in the back with the trimming coming from the major background fabric. Those extension strips will need to be inserted approximately 8″-9″ from one edge of both length and width. That’s for tomorrow. Done enough for today. Got further than I expected.